If we are reading straight through an entire book, as we are currently doing with Exodus, we take Wednesdays and Sundays off for a more general Christian message. 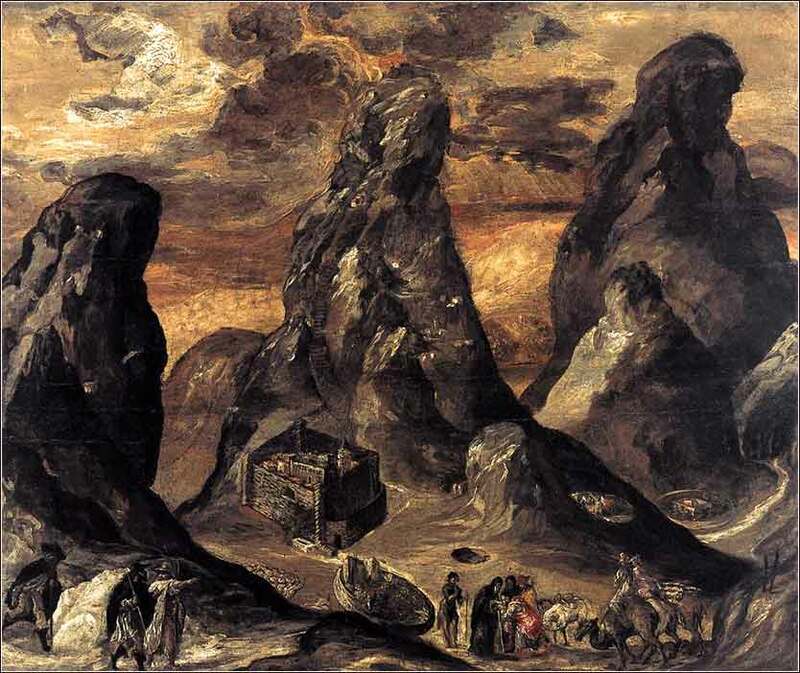 Mount Sinai by El Greco, ca. 1570. The wonderful Kyrie Eleison from Beethoven’s great Mass in C Major. 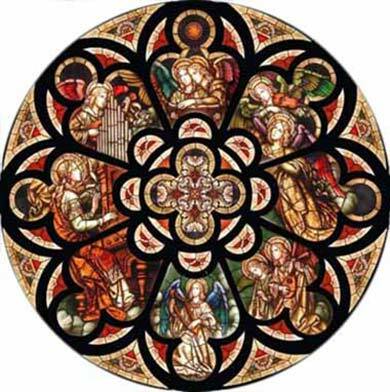 The lyrics are two phrases made from only three Greek words (kyrie, christe, eleison): Kyrie eleison (praise be to God), Christe eleison (praise be to Christ), repeated many times. Then Moses went up on the mountain, and the cloud covered the mountain. The glory of the Lord dwelt on Mount Sinai, and the cloud covered it six days. And on the seventh day he called to Moses out of the midst of the cloud. Now the appearance of the glory of the Lord was like a devouring fire on the top of the mountain in the sight of the people of Israel. Moses entered the cloud and went up on the mountain. And Moses was on the mountain forty days and forty nights. On his third trip up the mountain, Moses takes young Joshua as an assistant, leaving Aaron and Hur behind to maintain order and acts as chief judges in his stead. The details are only as specific as they need to be: it is impossible today to give an exact chronology or even to follow the events perfectly. For instance, the same language — "Moses went up the mountain" — describes both the first and second leg of the journey. We might say that Moses and Joshua took a six-day climb most of the way up the mountain. Then, Moses alone was summoned into a clouded part that encompassed some area of the peak, and from which one could see a fiery glow, where he stayed for forty days. What did he eat? It does not say, although Moses will later say that he went without bread or water (Deut. 9:9). What does "forty days and forty nights" mean? We do not know. It might be literal, but if so, it occurs time after time in the Bible and had some significance that has been lost to us. Some scholars believe that it was a Hebrew figure of speech, used for a long period of time less than a year. The modern equivalent might be to say that Moses stayed on the summit for "many weeks". The use of the"forty days" figure, and the later evidence of a fast, ties Moses strongly to Christ — specifically Christ's long temptation, which is also described as "forty days and forty nights" in the wilderness. Those whom God will make holy, so as to receive His direct communication and especially to receive laws to be revealed in His name to humanity, requires an extended period of total self-denial. We make a much-modified sacrifice of self-denial in Lent; and having read this, we can understand the nature of our partial fast more fully. Perhaps the vaguest statement concerns what God wrote on the stone tablets. The typical Christian understanding is that God wrote the Ten Commandments of Exodus 20 on stone tablets, which for some reason modern Christians must follow, while all of the other law of Exodus was written by Moses at God's behest and applied only to the Hebrews. One must torture the actual statement beyond toleration to conclude that such a reading is accurate; and, as we have seen, it is directly contradicted in Exodus 34. Generally, this doesn't cause much damage to Christians' understanding of how they should live their lives in Christ. Those who are going to try to read the Bible for instruction with an open mind and an attitude of humility can, actually, learn all they need to know in the New Testament. But a real understanding of Exodus, the law, and God's relationship with the Hebrews, adds dimension and depth to our lives.